Jack, age 2, one of last year’s ticked off kids. 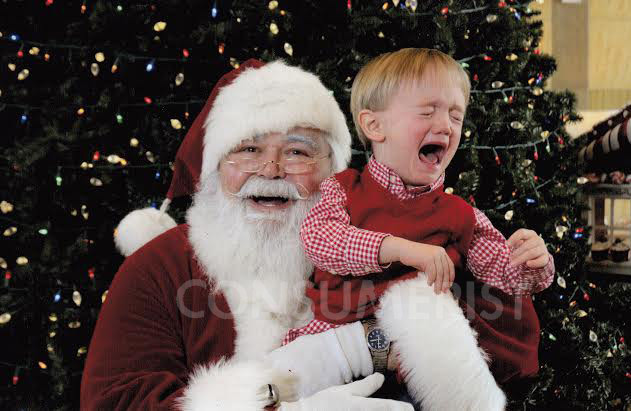 ‘Tis the season when parents pack their kids into the car, drive to the mall and deposit their offspring on the laps of mall Santas all around this great nation, which means it’s the right time for another of our favorite holiday traditions: seeing our readers’ photos of kids reacting hilariously to the bearded stranger their parents have forced them to hang out with. Yes, we want to see photographic evidence of children freaking out with costumed mall characters, and we want you to send them to us to share with the world. Do your parents have great pics of that time you tried to rip the Big Guy’s beard off during a screaming fit? Did your child burst into instant tears when faced with that red, velvety expanse of lap? 2. Include your child’s name and age in the body of the email (or if it was you way back when, your name, age at the time, and the year the photo was taken) along with any fun anecdotes about the experience. 3. Send it to tips@consumerist.com for us to enjoy, watermark and share on the site on Christmas Day. Please note, you need to be the child’s parent or the subject of the photo for your photo submission to be published, or we’ll have to get permission directly from the parents if you’re someone’s uncle or aunt. Gotta prove that stuff.